The onset of the global financial crisis in late 2008 caused huge disruptions across the board, leaving few economies with little or no bruises. The financial distress affected Southeast Europe as well, but the level of risk to which each of the 11 countries in the region was exposed and the national response to the challenges varied from state to state, depending on both global trends and idiosyncratic features. Most SEE countries experienced rapid lending expansion in the five years to 2008, a trend that came to a sudden halt with the financial turmoil of 2008-2009. In the boom years, banks in the region relied mostly on wholesale funding and on short-term capital flows from their foreign parents. In addition to hurting lending and economic growth and curbing investments, the financial contagion pushed SEE banks to seek funding through local deposits and focus on cutting their elevated loan-to-deposit ratios. The sovereign debt crisis in the eurozone, which intensified in the autumn of 2011, brought more gloom and fuelled fears of a credit crunch spilling over to the east. The eurozone crisis made some western European banks with significant presence in central and eastern Europe (CEE) revise their country growth strategies and limit their exposure in the region amid regulatory pressure to strengthen their capital. The rise in non-performing loans (NPLs) was another ill effect of the financial crisis, signalling more serious problems in countries with clear-cut boom-bust cycles, according to a report by the Vienna Initiative. In its 14 May 2012 special report on banking sector risks in emerging markets, global ratings agency Fitch flagged as still high the asset quality and solvency risks in Slovenia due to the country’s weak and heavily indebted corporate sector. The ratings service also pointed out that NPL ratios in Bulgaria, Romania and Croatia remained in double digits and were yet to hit their highest levels. Indeed, NPLs in Bulgaria rose by nearly 26% on an annual basis to 9.74 billion levs at the end of April 2012, according to central bank data released in May. However, the NPL ratio of approximately 16% poses no threat to the banking sector stability, given the sufficient capital buffers and very good provisioning, Bulgarian central bank governor Ivan Iskrov said at a financial forum in Sofia in May, as quoted by Banker weekly. Lending has traditionally been conservative in Bulgaria and the very good coverage makes bad loans not so bad, according to local financial expert Emil Hursev. 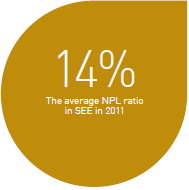 The average NPL ratio in SEE rose to about 14% in 2011 from the already high level of 12.5% in the prior year, given the sluggish lending environment and economic weaknesses in the region, according to the latest report by Raiffeisen Research released in June 2012. The NPL ratio of Romanian banks stood at 14.1% in 2011 versus 11.9% in 2010 and is expected to peak this year, the report said. Provisioning against sour loans remained high in 2011, weighing on the Romanian banking sector profitability. Romanian banks closed 2011 in the red, their second loss-making year, but their capital position remained strong. Lending is seen modest in 2012 with corporate loans projected to outpace retail loans, according to the analysis. Raiffeisen Research further notes that major foreign banks from Austria, France and Greece would be more cautious in their expansion in Romania this year amid the tough global and domestic environment. Overall, the banking sector in SEE remains sound, though some nations show greater resilience than others due to good risk controls, conservative credit management and other factors. In the same report, Raiffeisen said the NPL ratio in Slovenia reached 11.8% at the close of 2011, with the NPL ratio in the corporate sector standing at 15% and NPL ratios of large Slovenian banks hitting 13-14%. The NPL ratio in Croatia continued the uptrend last year reaching 12.4% at end-2011 with a further rise in 2012 potentially linked to the country’s subdued growth outlook, continued real estate price downtrend, rising unemployment and delayed bankruptcies in the corporate segment, Reiffeisen forecast. The analysts further underscore the main risk for Albanian banks as the sharp increase in NPLs to around 20% as at June 2012. The NPL ratio soared to 18.8% at the end of last year from 6.6% in December 2008, due largely to the negative trends in the construction sector that has been the driver of the Albanian economy for nearly 10 years. For 2012, NPL ratios in Albania are expected to rise further, but at a more modest pace compared to previous years. Still, the capital adequacy ratio of Albanian banks improved to 15.9% at the end of March 2012 from 14.8% a year earlier, according to figures released by the Albanian banking association in May. In its CEE Banking Outlook published in January 2012, UniCredit projected an improvement in the NPL ratio in Bosnia to 7.7% in the current year from 13.3% in the previous year and a further drop to below 4.0% over the medium term as commercial lenders enhanced risk management and the banking sector profitability improved significantly relative to 2010. The Italian banking group also expects more accurate NPL system-wide data from 2012 with the elimination of previous inconsistencies arising from the application of different financial reporting and international accounting standards in the two autonomous parts of Bosnia and Herzegovina, the Serb Republic and the Muslim-Croat Federation. Overall, the banking sector in SEE remains sound, though some nations show greater resilience than others due to good risk controls, conservative credit management and other factors. But the quick and sustainable resolution of NPL problems in SEE faces some delays stemming from the underdeveloped or inefficient legislative and institutional frameworks including tax obstacles, evolving insolvency regimes and the limited market for sale of distressed assets. In SEE, the stability of Greek banks remains at stake in the wider context of the deep financial and political crisis the country has been facing, including recent efforts to put in place a unity government. Greek households have been pulling money away from banks over the past two and a half years but recent fund withdrawals have taken an unprecedented size threatening the health of the banking sector amid concerns that Greece may leave the euro area and return to its former currency. While investors breathed a sigh of relief with the narrow victory of the pro-bailout New Democracy party at the June 16 parliamentary elections in Greece and voters’ support for the country’s stay in the eurozone, uncertainty continues to linger on as opposition against the austerity measures remains strong. Unsurprisingly, Greece’s four largest players National Bank of Greece, EFG Eurobank Ergasias, Piraeus Bank and Alpha Bank reported Q1 2012 losses with earnings battered by the country’s drawn-out debt crisis, the high level of political risks and the hefty provisions of a combined 1.5 billion euro the top four put aside in the three months to March 31, 2012. Though at still high levels and yet to be fully addressed, NPLs in SEE are not the main worry as all eyes are now set on the eurozone periphery, especially on Spain.